Long ago on Mars, water carved deep riverbeds into the planet's surface—but we still don't know what kind of weather fed them. Scientists aren't sure, because their understanding of the Martian climate billions of years ago remains incomplete. 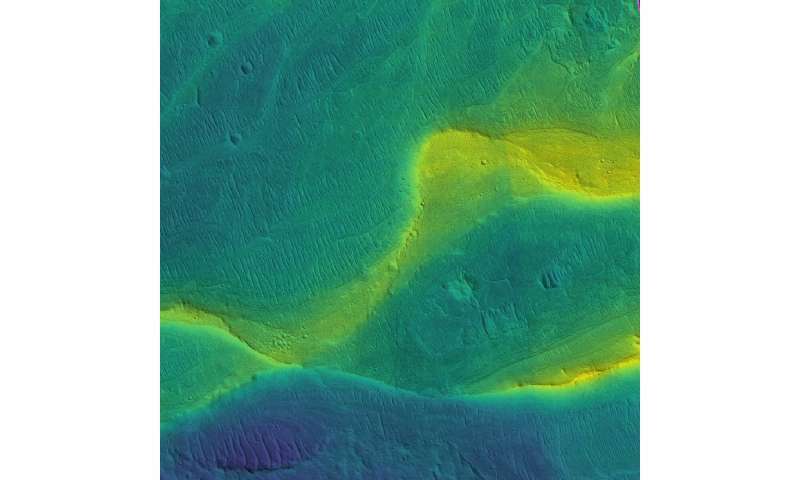 Mars is crisscrossed with the distinctive tracks of long-dead rivers. NASA's spacecraft have taken photos of hundreds of these rivers from orbit, and when the Mars rover Curiosity landed in 2012, it sent back images of pebbles that were rounded—tumbled for a long time in the bottom of a river. Yes, rather spooky, isn't it? If it wasn't actual water, then what caused all of those dry beds where liquid water should have been - or even ANY liquid. Perhaps all of the water was somehow mysteriously transported to Earth? SpookyOtto should be along at any time now. Otto wants to go to Mars. I'll be happy to sell you all tickets. Not responsible for any of your misplaced luggage that winds up in the trunk of my car. & uhmm fellas. you might want to reread this article or better yet the original papers. When the writer of this article as posted to the phys.org site? They forgot one tiny detail. that the floodwaters were present on Mars. I betcha researchers meant the First Aeon of Mars history. Okay, I'll be the spoilsport. This means. it has been at least 2 or maybe 3 billion years since there was any regular occurence of surface liquids of any possible chemical composition. Your dreams of the Towers of Helium, dried up & blew away one hellaciously long time ago! What if Mars got its water during intense periods of icy meteoroids, say annually as it passed through a cloud of meteorites. These would have vaporized as they entered the atmosphere, providing enough water vapour to sustain a green house effect, until it all condensed. Sure, I'm gonna believe what they say there! Just like I believe every flat Earth YouTube video! What evidence? Where has it been written up? Who needs a write up when a video has been peer reviewed by over 12000 YouTube goers. Alone their qualifications are 0 but when you multiply 0 times 12000 times electricity you get irrefutable evidence! Mars must have had something enabling it to be warm and wet that it does not have today. Mars is the "red planet" due to oxidation of iron. The oxygen came from water vapor in the atmosphere split by sunlight into hydrogen and oxygen and lost to space. We know Mars lost an ocean of water because the deuterium/hydrogen ratio is much higher than on Earth. Perhaps the trick is the otherwise thin Martian atmosphere enabled a vast amount of greenhouse gas water vapor to exist in the atmosphere causing positive feedback global warming to the extent that Mars was warm enough to keep liquid water. The water on the surface is explained at least in part by the Martian atmosphere being at or near saturation during this time, so even a little cooling at night could cause massive condensation. Surprisingly, the Martian atmosphere is still near the triple point, enabling a much more limited condensation observable on probe lander parts even today. Mars must have had something enabling it to be warm and wet that it does not have today. The remnant heat of formation. We know that there are enormous volcanoes on the planet, and they would have been belching large amounts of GHGs into the atmosphere. Primarily, CO2 and H2O. This would have allowed liquid water to exist at the surface. However, due to Mars being a small planet, and therefore having a higher surface to volume ratio than Earth, it cooled down more quickly, and the GHG input slowed to pretty much zero. No magnetic field to protect it from the solar wind, and lower gravity, meant the atmosphere could be stripped. auntie, last year, commenting about a previous Mars article. I speculated that meteoroid impacts could deliver detectable water to the Mar's surface. Though of course it would quickly subliminate away! When that party-pooper DS busts my toy bubble maker by pointing out the water detected on Mars has a different isotope ratio than that detected in space rocks. Again, as usual, you are not making any sense, rrwilliejoe. And what "Towers of Helium" are you talking about? Exactly WHO is dreaming of such Towers, and why would anyone think such Towers of Helium ever existed on Mars, rrwilliejoe? You and your friends here in physorg should lay off smoking weed. It is evidently shrinking your brain cells and making you sound like a talking dummy. Is Captain Beelzebub or Da Schniebo your ventriloquist, rrwilliejoe? The remnant heat of formation. 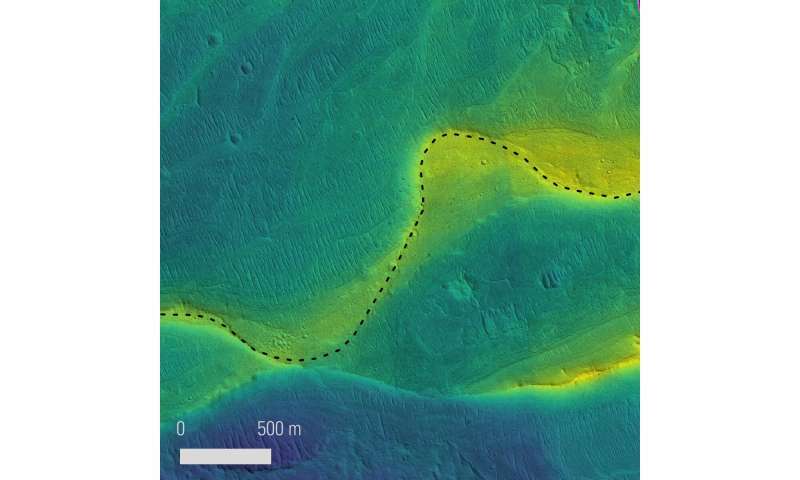 Agreed, as far as initially warm conditions go, but the article "conclude(d) that significant river runoff persisted on Mars later into its history than previously thought." As hard as it is to imagine today, perhaps Mars had a mostly water vapor atmosphere with added amounts of CO2, methane, argon, etc. The water vapor got into positive feedback global warming with more water vapor trapping more heat, thereby creating more water vapor from melting ice. I think all that water vapor fits with the available evidence, but is hard to imagine because Mars is so dry today. I think this is likely to be part of the story, but who knows if it is the whole story? Hypothesized to be volcanoes, until one decides to actually looks at the evidence to see they clearly are not volcanoes. Really? & no one responded? Am I the last literate commentator? May an ugly thoat poop on your head! cant, if you check around for online maps of Earth. For one that shows ocean bottom. There you will see shield volcanoes very similar to the ones left on Mars. The failure was to clarify that the Mars shield volcanoes are heavily eroded remnants, billions of years old. Yes, we have no eruption. Since, ohh, what time is it? Since about noon, eighth day of the fourteenth month of year one billion. Mars Zulu Time. "Whatta yah mean. How do I know?" "It says so on this souvenir snowglobe of The Towers of Helium. From my last visit, a gift from Carter." "Now I wouldn't lie too you. I may not always tell you the truth. But I'd hardly ever lie to you. Shield volcanoes don't have moats. Nor do they have four mile high scarps or aureole of grooved terrain surrounding them. There are numerous other features that are irreconcilable with volcanic activity, but you care not about facts but what is convenient for your brain cell. There is no evidence that they are not volcanoes. Link to it if you believe otherwise. Why don't you show us a earthly shield volcano that has any of these features. And don't forget to include those with overlapping craters as is seen on Martian "volcanoes". okay cant, you've put your (snicker) reputation on the line. If those are not shield volcanoes on Mars? What areslogy process could have produced that configuration of apparently ancient landscapes? In which aeon of Mars were those titanic-sized mystery barrows produced? Why doesn't billions of years of erosion & bonbardment explain the condition they are in today? Shield volcanoes on Earth do have similar escarpments & canyons surrounding them. That are buried under aeons of eroded materials in addition to Earth's active tectonics moving all those natural geological features around. A constant ongoing series of processing, covering them up & then exposing them multiple times. Are you going to deny that an important difference between the histories of Mars & Earth, has always been that Mars ilacks active tectonics? & has not been active in any meaningful way for billions of years? Except for the irregular collisions with sizable random asteroids? Stop avoiding the question - where is this alternative theory of the formation of Olympus Mons? It doesn't exist, does it? And what have craters got to do with anything? Lightning blisters of course, as has been shown in laboratory demonstrations. I mean actual science, not a bunch of crap from a Velikovskian cult. I know you are opposed to real laboratory experimentation, but that doesn't mean your hypothetical maths claptrap is "actual science". You are only projecting your own faerie tale beliefs and claim it to be science. It is a volcano, you loon. Nobody is claiming otherwise. There is nothing in the scientific literature claiming such idiocy. Where did they think this giant lightning bolt was going to come from? Let me guess - something to do with Venus doing handbrake turns around the solar system, and coming close to Mars? That is physically impossible. So, show me the science. Where is it written up? It is assumed to be a volcano, because it looks like a duck. That there is no challenge in the "scientific literature" is irrelevant. Where did they think this giant lightning bolt was going to come from? Let me guess - something to do with Venus doing handbrake turns around the solar system, and coming close to Mars? That is physically impossible. There are a couple possibilities, a close approach of a differently charged celestial body is one such possibility. And no, it is not impossible in a universe dominated by electromagnetism. Another possibility would be a solar event of magnitude beyond which has been observed in the solar system by modern humanity. Wrong. Not a single scientist is claiming any such thing. It is impossible. And EM does not dominate, except at very short range. And 'solar events' do not cause giant, directed lightning bolts. You are just spewing forth idiotic, Velikovskian pseudoscience. It is pathetic, and nothing to do with science. Which is why no scientist has ever claimed that such garbage happens. Regardless of your hand wavy claims, each of your comments is completely false. So link to the science, or I'll report your posts as continued pushing of pseudoscientific rubbish. Get on with it. Where is the science? Not a bunch of garbage from a pseudoscience site, featuring unqualified idiots. It is understood the solar system has changed dramatically through time, nothing impossible about it. The only difference being the timing, and what processes drove these events. And there are volumes written regarding human eyewitness testimony of events that occurred during human history, only your preconceived notions blind you from these facts. No, there is absolutely nothing about sudden changes in human memory. You are talking rubbish. Pure pseudoscience. And there is not volumes regarding eye witness testimony. Just fruitloops like Velikovsky and Talbott making stuff up. You have zero science. As usual. And there is not volumes regarding eye witness testimony. Willful ignorance is your own disease. I am not ignorant of anything. There is nothing to be ignorant of. You are lying. The criminal justice system relies heavily on eyewitness identification for investigating and prosecuting crimes. Psychology has built the only scientific literature on eyewitness identification and has warned the justice system of problems with eyewitness identification evidence. Methinks cd is relying on the dreadful misinterpretations of mythology by clowns such as Velikovsky and David Talbott. Awful stuff, and certainly nothing to do with science. I am not ignorant of anything. That is about the most laughable comment I have ever seen posted by anyone, anywhere. And of course, as usual, that is about exactly opposite of reality.